Thanks so much for looking after our little tykes! The photos and updates helped and were much appreciated while we were travelling. 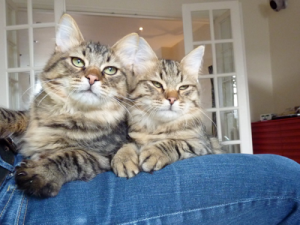 But proof in the pudding, so to speak, was when we came home to find Colwyn and Marlowe their usual happy selves. And a clean house and litter tray! It was such a difference from our other cat-sitting experience with someone else, where we came home to find a foul litter tray and two extremely cranky skittish cats.